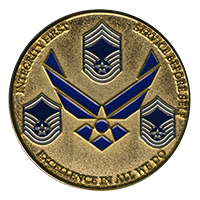 Challenge coins are widely well-received by women and men currently serving in the United States Air Force. As tokens of appreciation or commendation, few other items can speak as loudly as challenge coins about their bearers. Noble Medals is proud to be a part of this long-standing tradition! Founded by a fellow veteran that served in World War II and The Korean War, Noble Medals knows the importance of honoring the men and women who have fought to earn our freedoms. When you want to customize your challenge coins to the utmost extent, Noble Medals is here to help! There are numerous options to be had, and nearly limitless combinations of features at your disposal. 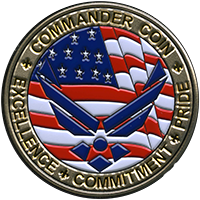 As a challenge coin maker, we make USAF challenge coins that are fully customizable. As the customer, you can decide everything from the edging of the coins to the wording, to the type of finish. This gives you the power to personalize it down to the finest details. Coins and medals have been around seemingly forever to help celebrate heroic actions or special dates. Our USAF challenge coins help members of this branch of service look back on their days spent defending this country. This is an amazing, historical marker that a veteran can pass on from generation to generation, illustrating the importance of putting your country first. 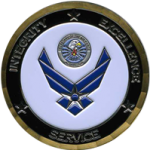 Our custom US Air Force coins last the test of time because we only use the most reliable and durable materials. The same cannot be said for plastic trophies, plaques or paper certificates. At Noble Medals, we want to send a huge ‘Thank you’ out to all service members, both past and present. We hope you will work with us to honor members of the United States Air Force.